Everyone loves playing with play dough! 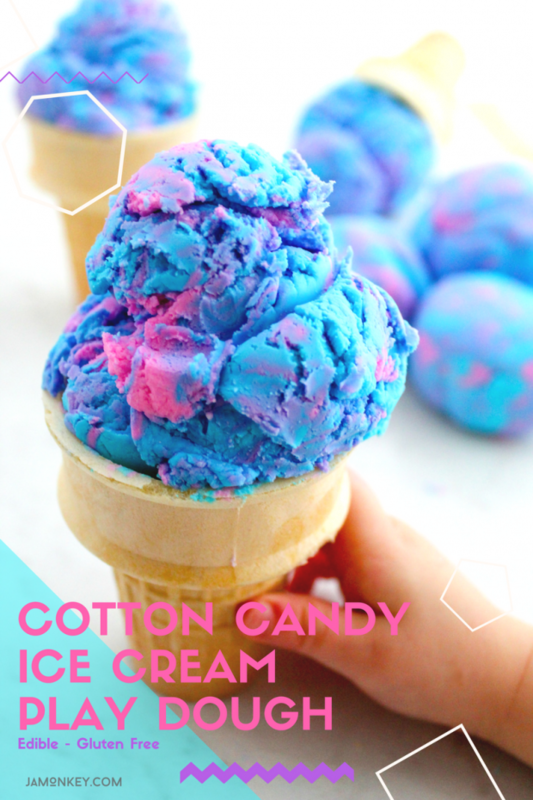 How about a fun cotton candy ice cream play dough you can eat!? 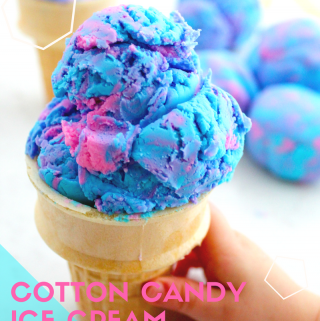 This is an easy 2 ingredient recipe to make this fun activity for kids. Break out the ice cream scoop, let's get making! 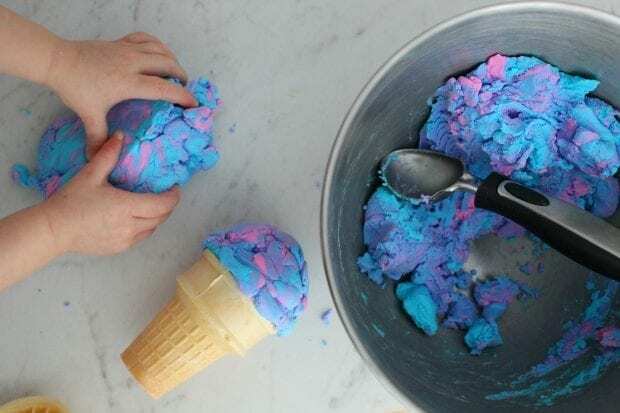 Allow the kiddos to enjoy playing with this play dough with ice cream cones, an ice cream scoop, sundae bowls, maybe even sprinkles! Who am I kidding, you HAVE to have sprinkles!!! Add 2 ¾ cups of powdered sugar to a stand-up mixer using the paddle attachment. 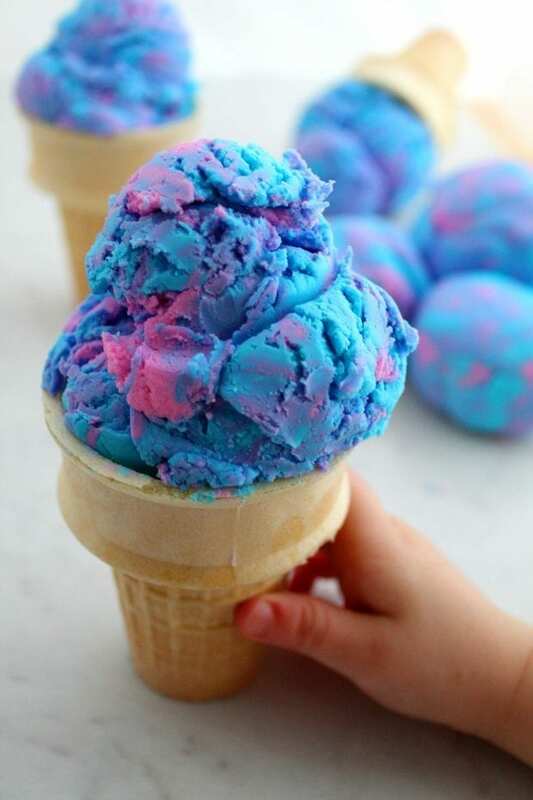 Add 1 cup of blue frosting. Mix on low, scraping sides as needed, until dough balls up into a playdough consistency. 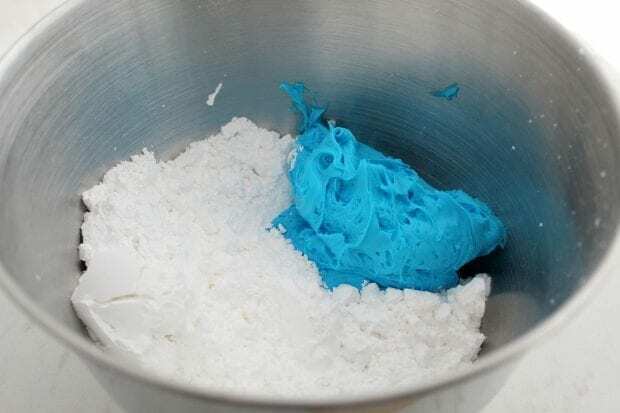 If the mixture is too powdery and is not forming a play dough ball, simply add a teaspoon of frosting and continue to mix. Remove the ball of blue play dough and set it aside. Repeat the previous step with the pink frosting. 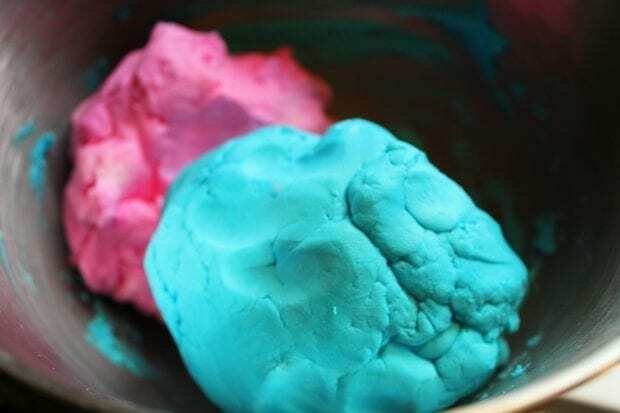 Add the blue play dough ball back into the mixer with the pink play dough ball. Set the mixer to low to blend the two colors together. Only mix long enough to mostly incorporate the pink into the blue. If play dough starts to dry up (which it will with the powdered sugar), add a drop or two of olive oil and work into the dough. Store in a ziplock bag in the refrigerator. Remove it and allow to come to room temperature before play time. Add 2 ¾ cups of powdered sugar to a stand-up mixer using the paddle attachment. 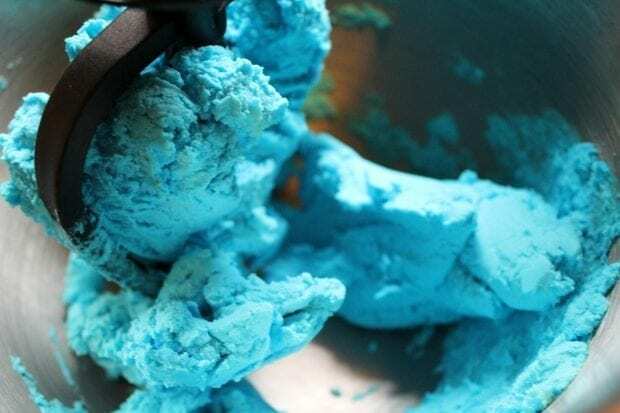 Add 1 cup of blue frosting. Mix on low, scraping sides as needed, until dough balls up into a playdough consistency. If the mixture is too powdery and is not forming a play dough ball, simply add a teaspoon of frosting and continue to mix. Repeat this process by adding 2 ¾ cups of powdered sugar to the now empty stand up mixer. 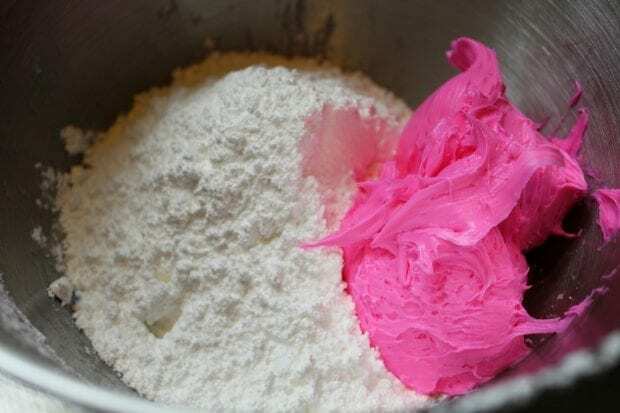 Add 1 cup of pink frosting and mix on low, scraping sides as needed, until a dough ball forms. 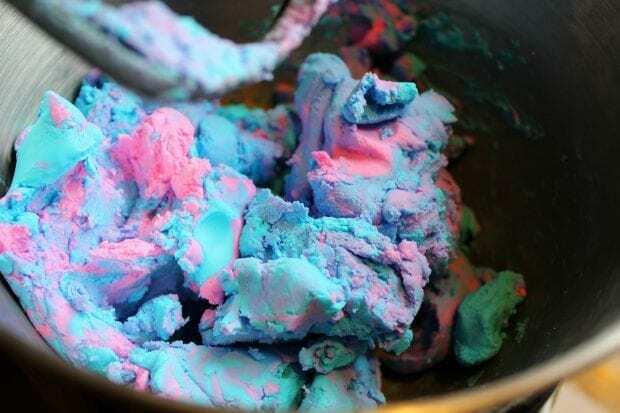 Add the blue play dough ball back into the mixer with the pink play dough ball. Set the mixer to low to blend the two colors together. Only mix long enough to mostly incorporate the pink into the blue. This looks so tasty…. I’m so hungry looking at it!